I was on a rocky hillside in Northern Namibia overlooking a valley studded with Mopane trees. Two herds of Burchell's Zebras were visible far below. The herds were communicating to each other with a series of neighing horse-like sounds. My PH, Barry, picked out a stallion for me and asked if I wanted him. I said "Certainly!" I had been three days on Safari and still had not harvested an African animal. The stallion was 300 yards away, downhill. I carried a .300 Win Mag and was shooting 180 gr Cor Lokt factory ammunition. I put the Zebra in my crosshairs and pulled the trigger. There was the sound of a hit. The Zebra ran with the rest of the herd. Barry thought I had hit the Zebra. I was not so sure. Barry sent the Herero trackers, Yassir and Alex, down into the valley to look for the Zebra. After an hour, the trackers had found no trace of the stallion. They did not find blood. According to the law of the African bush, if no blood was found, no hit had occurred. I was lucky; I did not have to pay a fee for the Zebra. I still had the bad feeling that I may have gutshot the animal. Barry and I went back to camp and had lunch. I was feeling bad about the Zebra and the three days of not harvesting an animal. Barry still exuded confidence. He said that the more time I spent in the bush the better my chances because I had been paying my dues. He said I would get the animals in my hunt package. After lunch we went to the Northern part of Barry's property, which was close to Etosha. We saw Elephant dung by the side of the track. Barry said the Elephants come from Etosha and sometimes they destroy the pipes at his watering holes. We came to a wide savannah. Across the wide expanse of grass, perhaps about 350 yards away, was a magnificent bull Kudu. The setting sun glinted off the beautiful Kudu's horns in the gathering dusk. The Kudu was looking right at us. The Kudu knew we were watching him. There were no trees to help in a stalk. To avoid wounding the beautiful animal, Barry did not want me to shoot at this distance. We watched the animal for a while; then the Kudu vanished by slipping into the bush at the far end of the savannah. We continued to hunt around the savannah. All of a sudden, a male Gemsbok was seen running in the grass about 80 yards away. I got real excited... my first decent shot at an African animal!! I tried to put the crosshairs on the Gemsbok. I was shaking uncontrollably!! Yassir and Alex, Barry and I looked for blood but could find none. It was a clean miss. Barry said it was good to get excited on a hunt. That is what makes it worthwhile: the excitement. I would have to learn how to control my excitement if I was to be successful on this Safari. I asked Barry not to tell anyone at camp about what had happened. I did not want the guys back at camp to know that I had experienced a debilitating attack of "Bok Fever". While we were having dinner back at camp, Barry said that we would go to another ranch tomorrow: Joss’s farm. Barry said Joss’s farm was right next to Etosha, contained many and abundant varieties of animals, and the terraine was fairly wide open. The next morning Barry, Jassir, and I went to the rifle range outside of camp to practice. After analyzing my technique Barry instructed me to slowly squeeze the trigger on my shots. I had the nasty habit of flinching and punching out my shots. I thanked Barry for the needed advice and gained confidence in my shooting abilities. to his two sons, aged seven and eleven. Joss is a great Lion Hunter. When young male Lions are kicked out of the pride to find their own way in life they frequently leave the territories of Etosha and enter Joss’s Farm. Joss is forced to shoot them to protect his animals. Joss’s eleven year old son has shot Cheetahs and Leopards. Boys grow into men at an early age in Namibia. Joss and his eldest son, Barry and I, and the trackers went looking for game. Not too far from Joss’s homestead we spotted a herd of Burchell's Zebras. I remembered Barry's advice. I slowly squeezed the trigger and took a shot at a large Zebra mare at 260 yards. The Zebra turned her head when I shot. The carefully placed bullet went through her head and into her chest. The Zebra dropped. My first African animal!! Barry congratulated me and asked if I wanted another Zebra. I said I sure would and put my scope on a smaller Zebra. I hit this Zebra in the chest and it fell to the ground. "Good shot!!" said Barry. I was overjoyed!! I had scored a double on Zebra! We brought the Zebras to the skinners. I wanted the old mare to be a shoulder mount and the unblemished skin of the younger animal for a rug. Joss and his boys would make Biltong out of the Zebra meat. We went out again. We saw a variety of game. We saw skittish Eland, regal looking Blue Wildebeest, graceful Impala, and beautiful Springbok. These animals were not in my hunt package except for the Springbok which we were scheduled to hunt in the Namib Desert later in the week. Joss's Farm appeared to be a hunter's paradise. We came to an area with long yellow grass. A herd of Gemsbok were in the grass about 160 yards from us. There were many smaller animals and a huge female. The female Gemsbok had long rapier-like horns. We did not see any bulls. Barry pointed out the female Gemsbok to me. The Gemsbok was running with the herd. I followed it with my scope. The Gemsbok stopped with it's left shoulder facing me. I squeezed off a shot after aiming carefully. 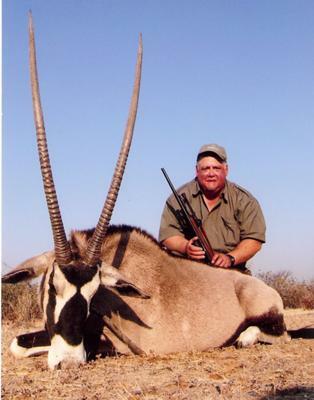 The Gemsbok dropped!! I could not believe it. My third animal in the space of a few hours!! My luck had changed. Barry measured the horns of the Gemsbok. They were of Gold Medal quality as determined by NAPHA (the Namibian Professional Hunters Association). Joss looked at me and asked me if I was happy. I told him, "Heck - yes I am happy. Thank you for letting me hunt on your farm!!" We brought the Gemsbok back to the skinners. The sun was now setting and the sky and earth were taking on tones of red and orange. We still had daylight left. We decided to go out again - this time looking for Red Hartebeest. Joss's eleven year old son knew where the Hartebeest were. We came to a long grassed savannah with a large grove of Mopane trees at it's edge. Under the Mopane trees was a herd of Red Hartebeest. They were at 260 yards. Barry picked out a "bull" for me. I took careful aim with my .300 Win Mag and slowly squeezed off a shot. The "bull" dropped and the rest of the herd ran off at top speed. When we got up to the fallen Hartebeest we found out it was a cow with exceptionally large horns. Joss and Barry started to laugh. They joked about not being able to tell a cow from a bull. I was happy. The animal was a splendid trophy. I had scored again. While the animals were being caped and skinned, Joss’s son gave us some homemade Biltong to eat. It was thick, moist, and meaty. Joss's son used his folding knife to cut the Biltong with. We thanked Joss and his sons for the wonderful hunt and returned to camp in the darkness. I was elated!! That night at camp I was the hero for the day. My dry spell had ended and I had the confidence in my shooting abilities return. In Las Vegas it may take many rolls of coins before a slot machine spits out a jackpot. Just as Barry said, I had spent my time in the African bush without scoring. I had paid my dues. I had ultimately hit the Jackpot in Namibia!! A great story of a sucessful hunt in Africa. I would like to do it also. I would call this an average story. I have taken quite a few african animals and they are gold medal as far as i am concerned one is right at a 60 inch KUDU that has never been scored and proably never will be. Good straight forward description of a successful hunt. It describes the hunt like it could have happened anywhere. it appears that African hunting is not like hunting deer on a stand in North America. Trying to keep one's Cool must be tough with the variety of animals. The Jackpot was a well written story of a hunter never giving up till achieving success. I enjoyed the story and the picture. I would like to visit Joss's farm also. I would like to take pictures of the different animals on his farm. To go to Africa would be a fantastic experience. Stephen was lucky he was able to go to Africa. I am a casino pro. I know what it is like to wait for a jackpot. My friend Steve is a lucky man. Not everyone is lucky enough to go to Africa. I hope he can go back again.